Turkish child pianist Arya Su Gülenç has received her latest prize on the international stage at a music competition in New York City. Born in Turkey's northwestern Bursa province, Gülenç started her piano education at age 6 and began giving concerts in world capitals one year later. Gülenç, now age 9, most recently won the U.S.-based Crescendo International Music Competition by earning a full score in her age group. Invited to New York City to receive her prize, Gülenç gave a concert at the famous Carnegie Hall on Feb. 10. "I get very excited before going on stage, but it is over when I get to the piano and touch the keys. I focus on the part I play, and I dream with different emotions in every part," Gülenç told Anadolu Agency after receiving her prize. Gülenç, who has ranked in international music competitions for the past two years, has given concerts in Germany, Russia, Bulgaria, Italy and the U.S. The third grade student is a participant in Turkey's project "Young Talents," which includes children selected by world-renowned artists such as Fazıl Say, Bülent Evcil, Cihat Aşkın and Ibrahim Yazıcı. Gülenç practices on a piano gifted to her by Say, the famous Turkish pianist and composer. In the future, she hopes to study abroad at a prestigious music conservatory. 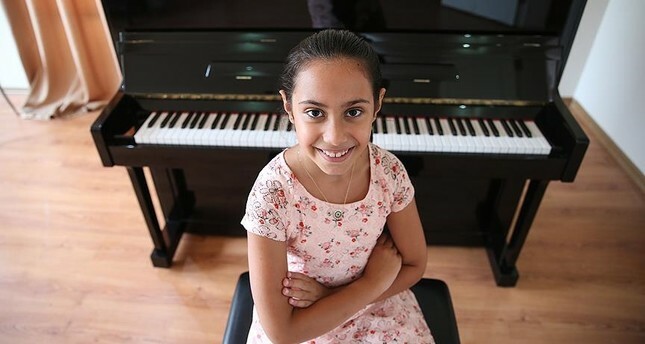 Her father Ümit Gülenç said that his daughter continues her intensive music education, following in the steps of world-famous Turkish pianists such as Say, Idil Biret and Gülsin Onay. He thanked the Turkish Consulate General in New York for their support during their visit to the city.